Are you sure your drinking water is safe? Did you consider checking out if you can trust the water filters you have at home? 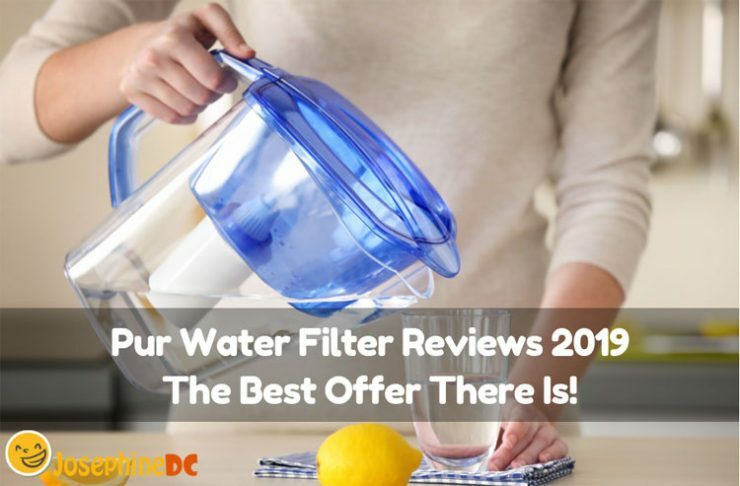 My PUR water filter review may raise your interest if you are still searching for a brand that will give you satisfaction in water filtration performance and lay your doubts to rest. As one of the giants in the water filtration business, PUR indeed is competitive enough to belong with the best. I will guide you down from the filter’s designs, effectiveness, speed, water taste, advantages, and even the downsides of it all. Find out what PUR can offer and choose what you think is the best. Discover it now! Why are water filters important? How does water filtration system work? 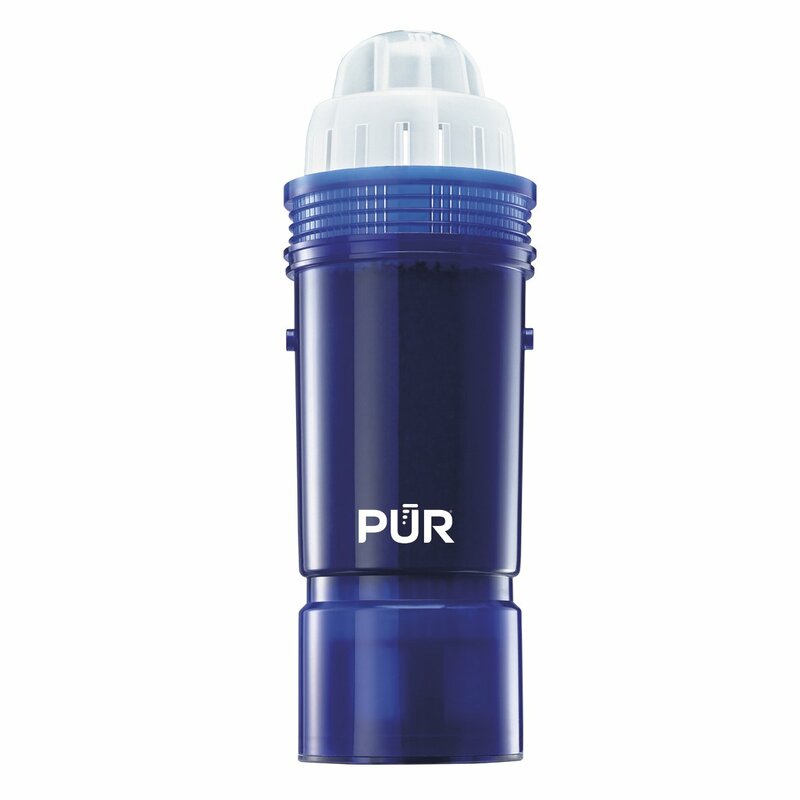 PUR offers two types of water filtration system in the market today. It is the faucet water filter and the pitcher water filter that I am going to review thoroughly for you. Both have filter replacements that you can buy form PUR outlets, distributors, or any store near you. You may find it convenient to use the pitcher water filter but also thinks that using a faucet water filter is practical. Although PUR has been innovating in water filtration for more than forty years, each still has its own pros and cons that will help you decide what to pick later. Water filters make our drinking water clean from impurities, takes away the bad odor and makes the water tastes better. Your water may look clear to you, but some particles are too tiny for your eyes to see. These may be harmless, but in some places, these could include microscopic bacteria and parasites that impose danger to our health. Our body depends on 60% water consumption so making your water safe to drink surely connects to health benefits. That is why water filters are essential to keep those contaminants away from our water. Shall I mention that filtering water helps with waste and environmental issues too? When talking about PUR filtration systems, you need to pick a choice. Choose between faucet and pitcher filters. These filters are actually similar in so many ways. Besides, the fact that you mount them in the kitchen, they function just the same. First, these two filters are similar in so many ways. Besides the point that you usually install them in the kitchen, they both contain ion exchange resin and activated carbon filters to clean the water. These units are POU hence; they are low in terms of cost. Point of use filters treats water for one faucet only. Pitcher Filter: This filter works by using gravity by forcing water through the carbon layer. This works out well for you alone or a small group of people but it is not convenient for a big family. The pitcher filter takes an average of eight (8) minutes before it pulls sufficient water from the tank. Its delivery speed is slow, and you need to do refill more frequently. As a downside, you need to reserve a space for the pitcher in the fridge just to keep your water cold. Faucet Filter: It is an advantage that this filter is fast in delivering adequate water supply. It holds a significant volume of water than pitchers ever can. Therefore, more weight applies to the carbon layers that gives more speed on the filtration process. Besides, you also have the luxury of having different preferences of how you like your water would be such as cold, hot, or unfiltered. However, PUR faucet filters certify to lessen over 70 contaminants including 99% of lead. In fact, it reduces 10 times more pollutants than other brands. Some may say that pitcher water filters are less efficient than the faucet. This may be because mostly, they found out that pitcher filters have low-quality carbon filters comparing to the faucet. However, not with PUR. 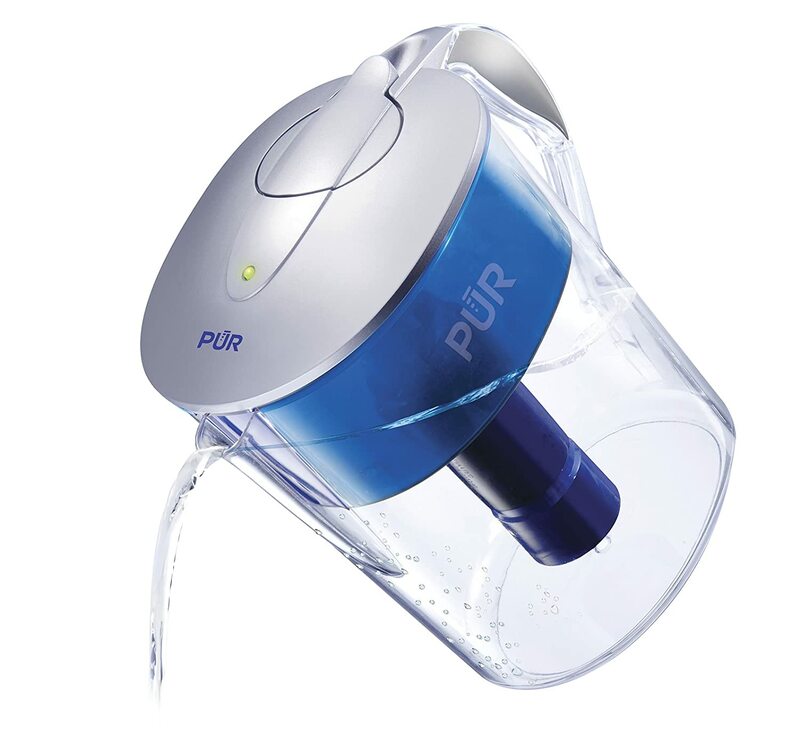 PUR pitcher and faucet water filters guarantee that they both have a superior water filtration system. However, of course, it always comes down to each preference. Mine could be different from yours. When it comes to robustness, a faucet water filter is always better than the pitcher. Yet, you must understand that whatever you choose, it would still need consistent maintenance routine. However, a pitcher water filter is easy to use, maintain, and simple to install. Faucet water filters, on the other hand, are complicated to mount and may end up to leaking when not done correctly. Because it is big, it also gets in the way when washing the dishes. For me, it would be a lot stress-free to buy a pitcher water filter than the faucet type. Aside from being less expensive, it is easy to use. Since we are on a home filtration system, you should be aware that usually these filters are made of activated carbon. The carbon absorbs organic compounds and pollutants. PUR water filters use coconut shells that undergo heat-treatment with steam. The process produces pores that have the smallest tunnels and spaces (1000 square meters of surface area per gram of carbon) than any other carbon filters. With this, it guarantees to remove pharmaceuticals, chemicals, heavy metals, and organic compounds besides chlorine. Surprisingly, it leaves behind beneficial substances like fluoride. Do you want to see how it works? In buying a water filter, you should keep in mind the speed, efficiency, price, taste, and its pros and cons. Although PUR filters outstand when it comes to those categories, I still suggest choosing wisely. The filters in my list rank as the bestsellers in the market and have garnered the most positive reviews and endorsements. Check out the one that you think is the best. There are two kinds of PRU faucet water filters. They are the horizontal and the vertical mount. See what type is comfortable and applicable in your kitchen. PUR water filtration faucet (horizontal mount) has a three (3) stage filtering system and comes with an LED indicator. This built-in electronic filter life indicator (Clean sensor) keeps track of the filter life, and you do not need batteries to keep it working. Green light means the water is clean and red means you need to replace the filter. Per record, this filter expediently delivers up to 100 gallons of healthy, clean water in an average of two to three months. In contradiction to what many have experienced with faucet filter installation, this PUR faucet filter mount is easy to mount directly to your faucet. This faucet water filter may be incompatible with pull out and handheld faucets, but at least you can enjoy the convenience of choosing either filtered or unfiltered water with just a flip of the switch. It comes with four adapters that should accommodate most faucets. You can choose between chrome and stainless steel material for this type or pick colors of metallic grey, white, or black. Not only that but with its superior contaminant removal, it also offers a two-year warranty! It has low pressure when in unfiltered mode. 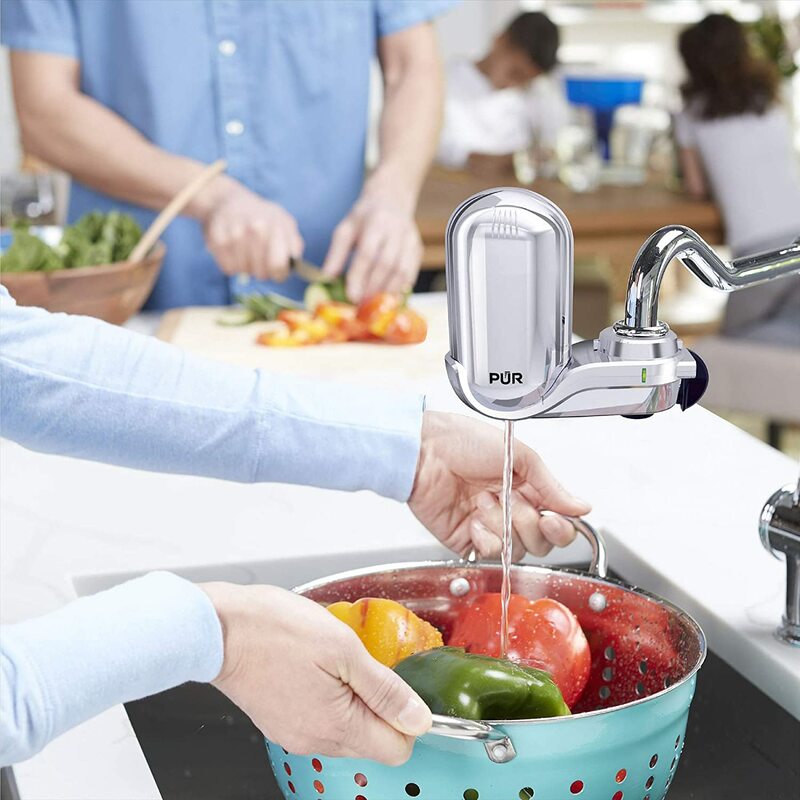 PUR advanced water filter attaches directly to your sink faucet for easy, quick access to a cleaner, safer, and better tasting filtered drinking water. Like the horizontal type, it also comes with an LED indicator display to show the filter status, so you will know when it needs replacement. The 100 gallon of filtration within two to three months still stands with the use of activated carbon and ion exchange. This three(3) stage filtration system also guarantees to decrease more than 70 contaminants, chlorine, including 99% of lead, 92% pesticides, and 96% of Mercury. This faucet filter features MAXION filter technology and a 1-click tool-free attachment to make installation easy and stress-free. The size is small enough not to occupy much space and gets in the way while washing the dishes. Including the filter, the whole set weighs a pound or so. This is a more natural way to get a cleaner, tastier, and safer drinking water straight from your faucet. Choose available finishes of chrome, black, white, and stainless steel. Has a bypass switch to turn off. Comes with adapters to fit your faucet. Do you want to see how to mount this faucet water filter? Check out this video. Two filter replacement models that are in demand for PUR faucet filtration system. It is RF-9999 and RF-3375. Both are leading in supporting filter replacements for both the horizontal and the vertical PUR faucet filtration system. Hence, do not be confused if you encounter both since any of the two will serve its purpose. 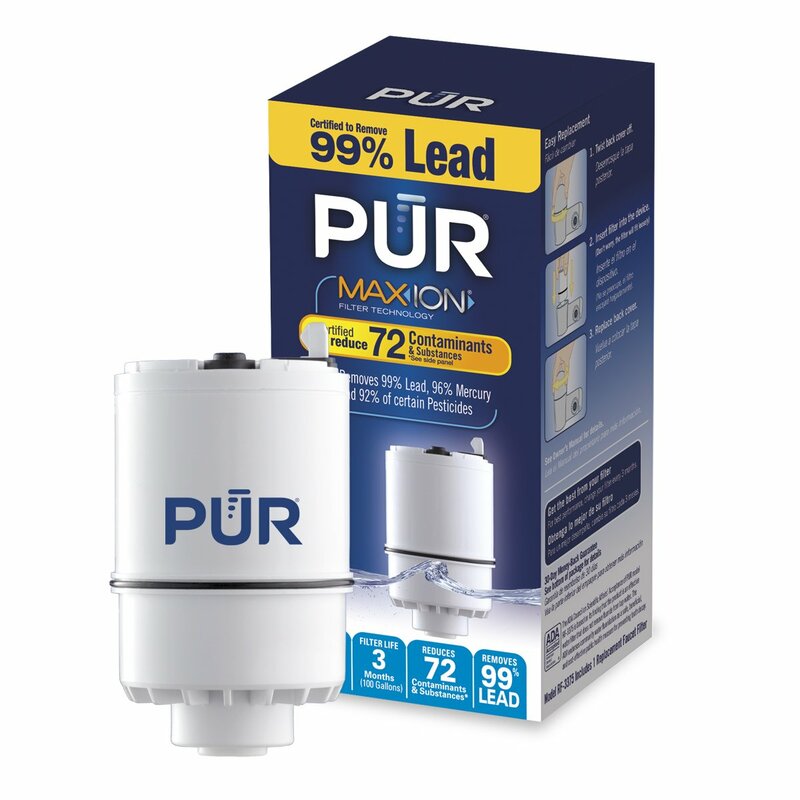 Both faucet filter replacements are with MAXION filter technology, PUR’s unique formulation approach for blending carbon and ION exchange materials. Please take note that RF-9999 is a 3-stage filter while RF-3375 is 2-stage. 2-stage filters may not reduce contaminants as much as the 3-stage does, but you can buy it at a lower cost. Replacement filters sell in a multiple of 2, 3, 6, and 12 packs. I have bought the six (6) packs for my reserves since it is ideal as home ready stocks and light to my budget. Replacements assure to be the same as the original filter that comes with the filtration system that you bought. The same high-quality filter reduces 70 and more contaminants including 99% of lead. RF-9999 filters water over natural minerals and still delivers clean and great tasting drinking water. Remember that each filter gives 100 gallons of filtered water at an average of three months before it is due for a refill. 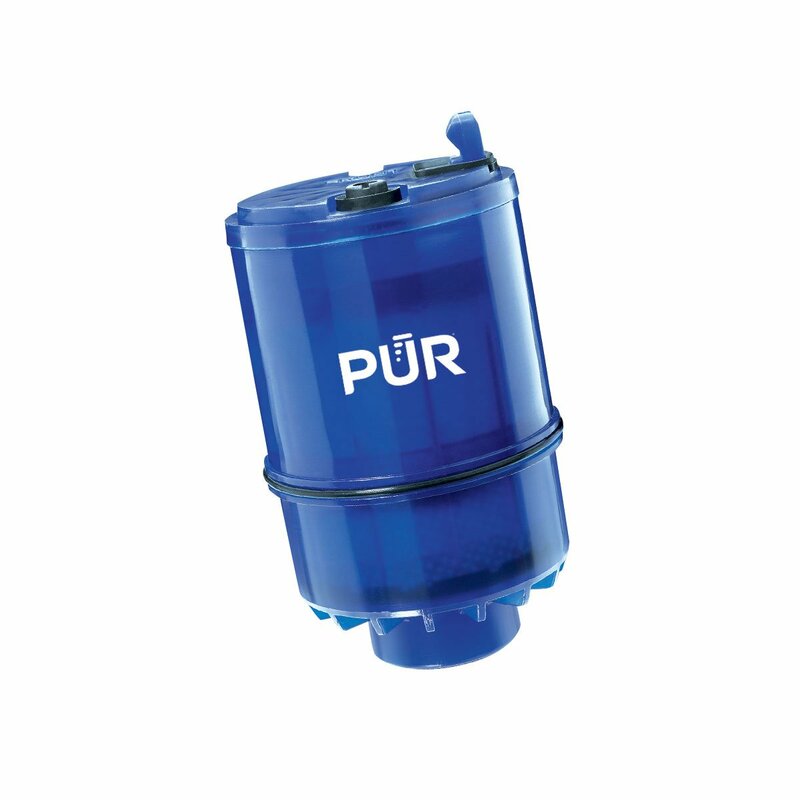 You may find other filter refills that fit the PUR faucet filtration system, but nothing functions well as its PUR filter replacement. Only PUR filter replacements certify to lessen contaminants with its match filtration system. For me, if the unit is PUR, then I may use PUR filters as well. With its superior water filtration, you can save up to $1000 per year compared to using bottled water in the market. To mention, this filter absorbs and trap the contaminants with its 200,000 square feet of nooks and crannies that make you enjoy drinking water straight from the tap. It removes 99.9% of Microbial cysts and lessens Mercury, chlorine, and more. Both replacement filters are compatible with any PUR faucet filtration system. Both are with MAXION filter technology. It may not reach the 3 months life as stated when water is highly contaminated. To avoid any problems with your filters especially with the LED indicator reading, make sure to do the replacing correctly. If not done properly, you will notice that the light turns on the red color. Here is a video showing you how. The 11 cups classic pitcher filtration system fits in your refrigerator so it would be easy for you to have access with cleaner drinking water. Like the faucet type, this too has an electronic filter indicator light that displays the filter status. With this, you will know when to change the filter. The 2-stage filter certifies reducing 22 contaminants and provides 30-40 gallons of filtered water in 1-2 months’ time. The superior water filtration (MAXION) shows that it reduces contaminants including chlorine (lessens the bad odor and taste) by using activated carbon and ion exchange. The filter removes 95% of mercury and 96% of trace levels of pharmaceuticals but still leaves behind the fluoride. PUR pitcher is a clear plastic material, so you can see the water level inside and is available in different sizes like the 11 cups and 7 cups. I like the 11 cups pitcher that is 10” tall and has a separate opening that is convenient when refilling. It comes with a free filter upon purchase, and the LED light comes with a battery as well. It has a separate opening for refilling purposes. The lid fits securely so as not to snap during pouring. The plastic material is delicate and is prone to cracking. Check out this video to see how PUR pitcher water filter works! Of course, like the faucet filtration, the pitcher also has available filter replacements found in the market. You must replace filters usually between 1-2 months, depending on your family’s usage. The price is reasonable; hence, you will come up with big savings when using this. For environmental issues, this process replaces about 3000 bottles within a year. As WQA certifies that this filter removes 99% lead and passes the NSF certification and tests as well. No matter what size the pitcher is, this refill will fit as long as it is PUR. Take note that PUR filters are recyclable so you may want to remember before throwing it to the trash. If you hear some complaints about the filter releasing black particles in the water, it should be from the black ring (gasket) that ensures the filter works well. Just tighten the gasket to avoid this problem. Have you decided whether you want a faucet water filter or pitcher water filter? I have detailed my PUR water filter review as much as I can to make it easier for you to choose. Bottom line, pitcher or faucet, your home needs these filters for your family’s safety. You may have your own need when selecting, but it all goes down to each preference. I suggest picking the faucet water filter if you have a big family. It would be convenient and practical. Nevertheless, if you are just a small group, the pitcher water filter will work fine for you. Both are superior in removing water impurities, so it is up to you what you think is best to install at home.